On behalf of the Committee I welcome you all on this historic and unique occasion, the official unveiling ceremony by An tUachtaran na hEireann Dr. P. Hillery of the National Memorial honouring our dead seamen of the 1939/45 war period we extend a special welcome to the dependents and relatives present and a sadness at the absence of so many of our friends and supporters who are no longer with us. 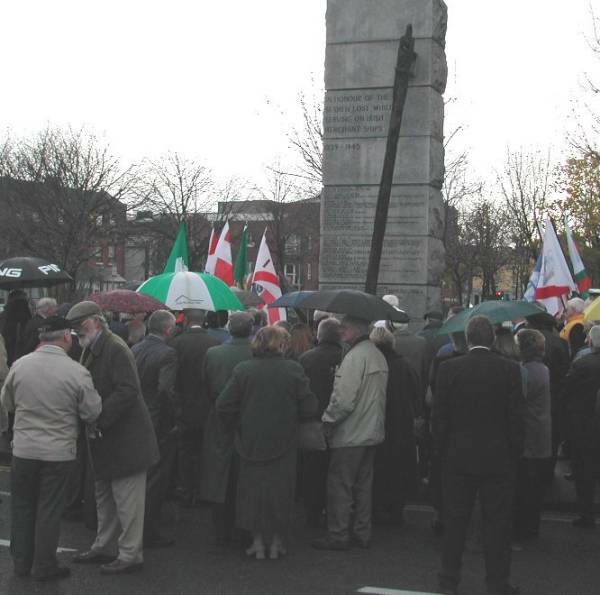 "Ar Dheis De go raibh a anam "
Since 1947 many attempts to have a National Memorial erected went unfulfilled for various reasons beyond the control of those involved till 1977 when the present Independent Committee was formed and as a result of 13 years of persistent effort succeeded in completion of the project. Those we honour to-day were unique in that as civilians of a neutral country carrying out their normal functions at sea, bringing essentials to Ireland, they were drawn into the ensuing conflict between the great powers resulting in heavy loss of life and limb with a casualty rate of 17% the highest ratio among the combatants and neutrals. fellow countrymen, except their loved ones who mourned their loss and comrades who remember them each year at the Commemoration Services organised by the Maritime Institute. Our motive in erecting this Memorial was to correct this omission and give testimony to future generations of the Seamens contribution to the survival of our Nation in very difficult times when the call to serve was responded to by thousands ready to endure, but none had to face the hazard of almost daily confrontation with death among the belligerents while in a totally defenseless state protected only by the silent prayers and the word 'EIRE" painted on a rusted hull. Our hope that the Nation being an Island would have learned the lesson of dependency on others, appears misplaced when one see 85% of our essential commodities being carried on foreign based vessels while trained personnel are redundant and young people are denied the opportunity of making a living and career from the sea. Till recent years the Irish Flag flew proudly in all the ports of the world while to-day it is conspicuous by its absence in our own home ports. Must we only look to the sporting fraternity to see the National Flag fly abroad, however, grand and joyous the occasion, it is only a substitute for a native owned Merchant Fleet manned by Irish Seafarers. 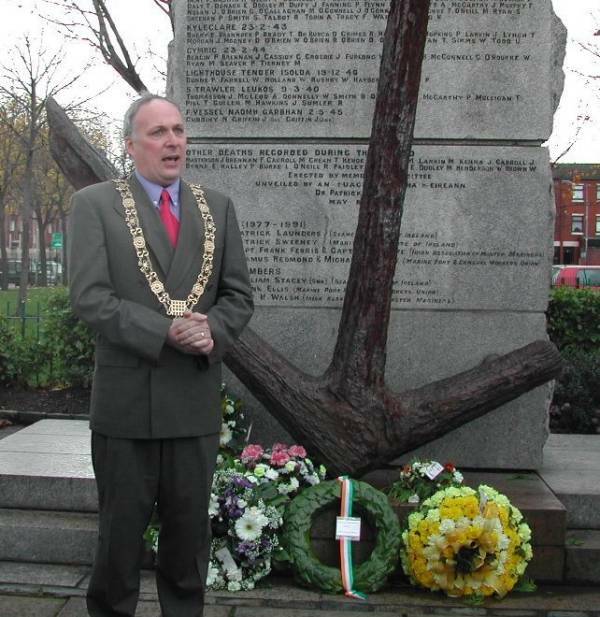 "SURELY ITS TIME THE GOVERNMENT GAVE IRISH SEAMEN, WHO HAVE CONTRIBUTED IN NO SMALL WAY TO THE SUCCESSFUL DEVELOPMENT OF OUR COUNTRY, THE CREDIT THAT THEY DESERVE." The following names are those of Seamen lost on Irish ships during the 2nd.World war. 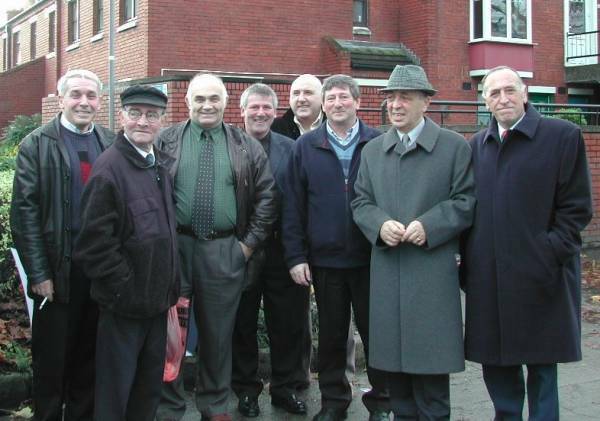 BARRY, E. BARRY, M.J. BEGLEY, T. BERGIN, P. BENT, P. BRADY, T. BRAN NOOK, P. BRENNAN, H. BRENNAN, J. BROWN, W. BRULAND, E. BURKE, L. BYRNE, E. BYRNE, R.
CARR, W. CASHIN, C. Cassedy, C. CLEARY, P. CONNOLLY, W. CONWAY, J. COWZER, F. CRICHTON, R. CRONIN, J. CROSBIE, J. CUDDIHY, N. CULLEN, M. CUSACK, M. CUSACK, T. CUSHBY, W.
DALGARNO, J. DALY, T. DAVISON, W. deBU RCA, D. DESMOND, B. DONAGH, E. DON NOLLY, W. DONOHOE, T. DONOVAN, P. DOOLEY, M. (Snr) DOOLEY, M. (Jnr) DOYLE, W. DUFFY, P. DUNNE, P. DRUMMOND, C.
FANNING, P. FARRELLY, P. FENNELL, J. FORD, T. FORDE, M. FRITZSON, K. FURLONG, G. FURLONG, K.
GEARY, D. GREENE, E. GRIFFIN, J. (Snr) GRIFFIN, J. (Jnr) GRIMES, R.
HAMILTON, A. HARE, T. HARTNE1T, T. HAYDEN, J. HAWKINS, J. HENDERSON, W. HENDRY, N. HOLLAND, W. HOPKINS, P. HOWAT, J.
KAVANAGH, E. KEARNEY, E. KELLEHER, J. KIERAN, B.
LAMBE, J. LANE, J. LARKIN, J. LEONARD, M. LYNCH, T.
Cecil McConnell. P. MCGLYNN, J. McGUIGAN, P. McKANE, S. McLeod, A. McMahon. McMahon, S. MCNALLY, S.
NAUGHTON, G. NAUGHTON, J. NAYLOR, S. NICHOLL, G. NOLAN, J.
O'BEIRNE, D. O'BRIEN, D. O'BRIEN, G O'BRIEN, R. O'BRIEN, W. O'BRIEN, W. O'CALLAGHAN, JAMES O'CONNELL, M. O'CONNELL, J. O'CONNOR, J. O'DONNELL, M. O'FLYNN, P. O'LEARY, E. O'LEARY, T. O'NEILL, M. O'NEILL, P. O'NEILL, P. O'ROURKE, W. O'SCANLON, P. O'SHEA, F.
PAISLEY, W. PILL, A. PLUNKETT, B. PORTER, J. POWER, J. POWER, J.
RAYMOND, M. REGAN, J. REYNOLDS, J. RICKARD, J. ROBERTSON, A. RYAN, M. RYAN, P. RYAN, S. RYAN, W.RUSHBY, T. SEAVER, P. SHEEHAN, P. SHORTT P. SIMMS, W. SMITH, S. SMITH, W. SMYTH, W. SPANNER, J. SPEED, E. SPENCE, R. SULLIVAN, J. SUMNER, J.
TALBOT, R. THOMPSON, J. TIERNEY, M. TOBIN, A. TOBIN, J. TODD, U. TREACEY, F.
"The Irish Press", Saturday June 21, 1952, page 5 as part of a series "The Brave Ships", heading "Kerry Head and All Hands". They were taking in the hay around Kinsale, on the fine August evening (1940), when the first sign of war glinted in the sun over the old historic town. A bombing plane roared over the bay of Ballymacous and circled the Sovereign Islands. John Hurley is a small farmer, seafarer and pilot at Kinsale, and he was making up a rick of hay in his haggard. He looked at the sky when the bomber's roar ripped the silence and he watched the dark wings of it rushing to the sea. John scanned the bay. There was a ship out there. A three masted ship with derricks forard. He knew her well. Kerry Head of the Limerick firm of Mullocks. Out near the Old Head of Kinsale he saw the plane dive - just where the ship was. Two explosions rumbled from the sea. John called two of the men who were making the rick and with him (his brother Pat and Tim O'Donovan, since dead) and ran to the shore even as the plaintive siren of Kerry Head moaned on. The three men rushed the boat into the water, pulled at the oars. They were fast oarsmen, those men of Kinsale. Half a mile outside the Bullman Rock they saw Kerry Head. She was stopped but seemed undamaged. John pulled alongside, clambered aboard. He saw Captain Charles Drummond and asked him what was wrong. The Wexfordman answered: "The plane bombed us." Two light bombs had been dropped forard, missed the bridge and hit the sea right beside the vessel. A heavier bomb had fallen about five yards to the starboard side of the engine room. The concussion had stopped the engines, the impact of the sea had crushed in the vessel's side. The cabin quarters were a shambles. The forard winch had been cracked on both sides by the concussion alone; doors had been wrenched from their hinges; the compass was smashed; the glass from the wheelhouse windows was all over the place; cooking pots, tinned foods and crockery were spattered on the decks. One of the lifeboats had got locked and entangled in the davits. The other lifeboat had been lowered but was filling with water. And, after all that, nobody was hurt. The crew stood by in lifejackets, some were disentangling the locked lifeboat. John Hurley's boat took the captain ashore to make the report to Limerick, where he was bound from Britain with coal and tinplate for that city's factories. The engineers and crew stowed everything, rushed the ship to Garley Cove, to ground her on a sandbank, so that repairs could be carried out. The Kerry Head was saved - for three months. 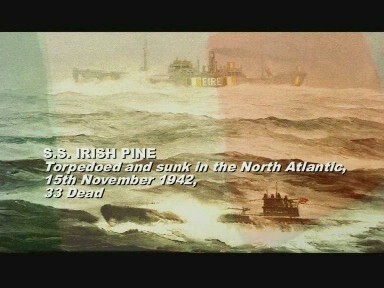 In October of that same year, the 1,000-ton ship was passing Castletownbere, travelling light. Local people at Blackhall Head recognized the familiar outlines of the vessel. She passed out of sight. A bomber again swept over the coast, dipped down at the horizon, where the Kerry Head had gone hull down. Nobody could say, for certain, whether the plane had bombed the ship. Local boats searched the area when the signal went along the coast. 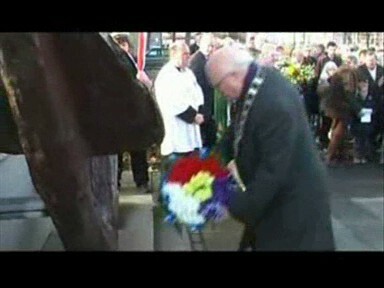 But Kerry Head had passed Kinsale for the last time. Scattery (cousin of Stephen); James Wilson, Carrickfergus. 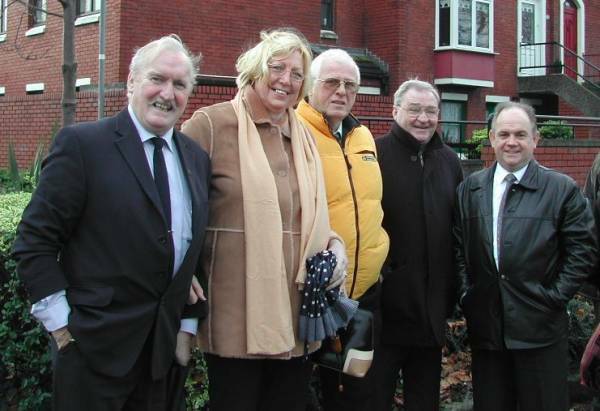 (long time seaman's union leader) INCLUDED IN PHOTO ARE:- BOBBY CARRICK AND PAUL BOLAND OF THE S.U.I INCLUDED IN PHOTO ARE:-JOAN McCAIN AND PAUL SMITH OF S.I.P.T.U. My name is Carl Leckey I am a retired Liverpool tug boat mate. I live in New Brighton on the banks of the River Mersey. I was planning to have the plaques in situ before the anniversary of the tragedies. Unfortunately because of delays Xmas holidays etc this now looks unlikely. I am advised it will occur as soon as possible. I have written to the Irish Embassy London and the Irish club Liverpool notifying them of my intention. Sadly I have had no response. It appears the war dead are not remembered despite of the declarations otherwise. 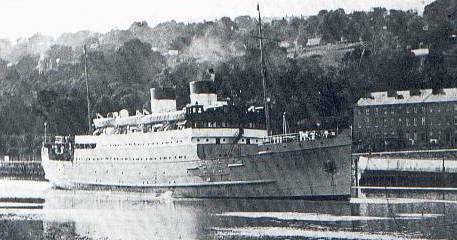 Innisfallen was a passenger ship owned by the City of Cork Steam Packet Company and on 20th December 1940 she was operating between Dublin and Liverpool, commanded by Captain George Firth of Clontarf, Dublin. At 6pm on 20th December 1940. she left Liverpool landing stage for Dublin with 157 passengers and a crew of 63. She had just left the berth when air-raid sirens began sounding a warning and the harbour authorities closed the port to navigation. Captain Firth anchored the ship in the river as bombs and mines fell about her. At daylight, it was reported that there was an unauthorised passenger on board and when the ‘All Clear’ sounded Captain Firth took the ship back to the stage to land him. In the early afternoon, the port re-opened and at 3pm Innisfallen again sailed for Dublin. Twenty minutes later, when moving slowly down river past New Brighton tower, a massive explosion occurred just forward of the bridge on the portside, a magnetic mine had activated. Three crewmen were killed outright and quartermaster Daniel Geary sustained injuries from which he died a few hours later. Two other seamen and Captain Firth were wounded. However, Captain Firth remained in charge and ordered the evacuation of the ship. He was the last to abandon his ship by sliding down a rope onto a tug that assisted in the rescue. Innisfallen sank fifteen minutes later. The Tower buoy off New Brighton marks the location of the wreck. 157 Passengers and the remainder of the crew were rescued. McCarthy, Patricio (1897-1940), merchant seaman, was born in Balcarce, Buenos Aires province, the son of John McCarthy (b.1860) and Mary Callaghan (b.1859), and brother of Timoteo McCarthy (b.1895). John and Mary McCarthy were dairy farmers, originally from Ballyclough in Mallow, Co. Cork . They emigrated from Queenstown ( Cobh ) to Argentina onboard the steamer City of Dresden , arriving in Buenos Aires on 16 February 1889 . At the early age of eight, Patricio McCarthy was brought to Ireland together with his brother Timoteo, and ended up in the Sacred Heart Home, Drumcondra, run by the Sisters of Charity. In 1906 the McCarthy brothers were sponsored by the St. Vincent De Paul Society and sent on to St. Vincent 's Orphanage, Glasnevin, in Dublin . Spanish was their spoken language at the time. Both brothers went to sea, training in the catering departments of various shipping lines. Patricio McCarthy served on the Irish registered fishery protection vessel Fort Rannoch before he lost his life on the steam trawler Leukos on 9 March 1940 . Timoteo served in Irish shipping throughout the War World II. He was also a great friend of Captain Carlsen of the Flying Enterprise, and died at sea in August 1960, being buried in the Catholic Cemetery , Cimitero Latino, Rue De Port Said, in Alexandria , Egypt . 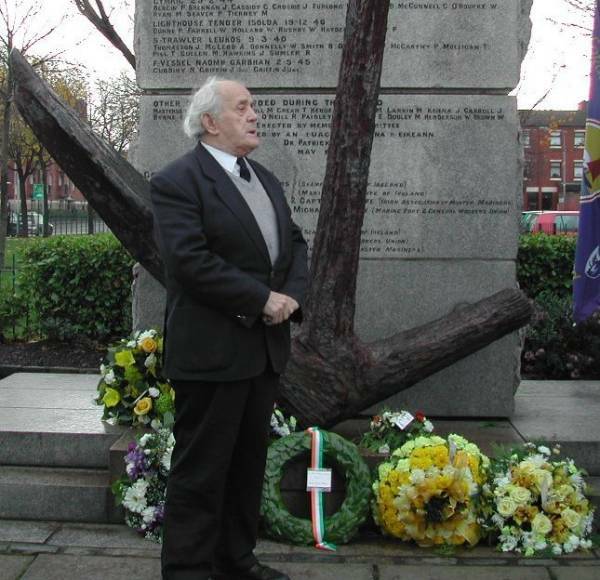 Patricio McCarthy was the only Argentine citizen lost on an Irish registered vessel during World War II.